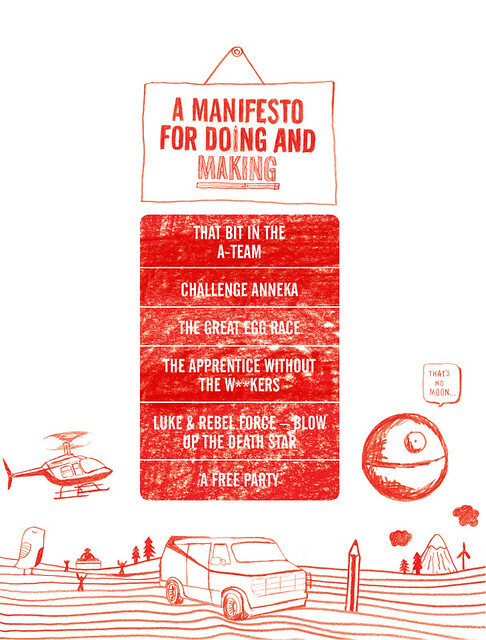 The second Good For Nothing manifesto touted the event (20-22 May) as everything from ‘that bit in the A-team’ to ‘The Apprentice without the w**kers’ , writes John Ridpath. 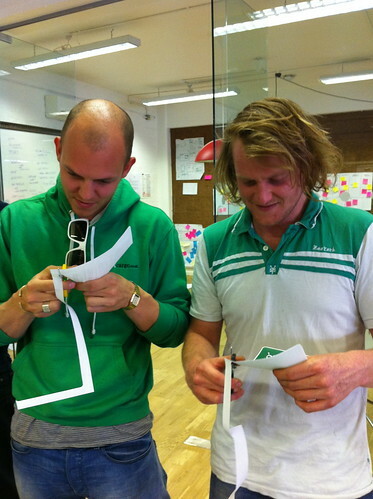 The recipe was simple: take three social and environmental organisations, come up with some ambitious briefs, and set loose a crowd of enthusiastic designers, developers, communicators, film-makers, animators, writers, illustrators, hackers, strategists and planners. The weekend was hosted at London’s Splendid Communications, and the doing and making was fuelled by food, drink and pumping music. On Friday night, participants decided which organisation they wanted to work with: Bletchley Park, historic site of secret British codebreaking activities during the Second World War and birthplace of the modern computer; Food Cycle, who co-ordinate volunteers, surplus food and free kitchen space to create nutritious meals and positive social change; and Gnewt Cargo, the UK’s first zero-emissions logistic service, operating a fleet of pedal and electric-powered vehicles and creating plenty of new jobs in the process. I signed up to the Gnewt Cargo team. After a visit to the depot (and a quick spin on the Cargo Cycles) early Saturday morning, we headed back to the office and within minutes people were busy doing and making things. Our plans were ambitious: redesign Gnewt’s logo and brand identity, and plan, design and start building an entirely new website by 4pm Sunday. 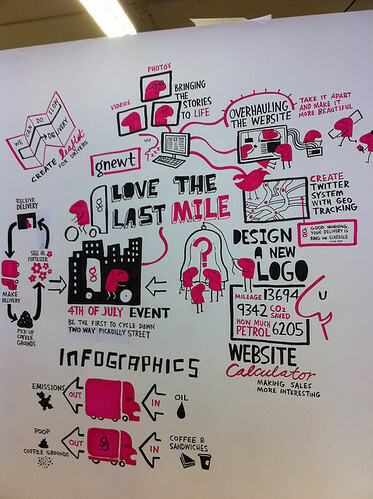 Planning, design, content-creation and coding had to take place simultaneously, with much frantic emailing of logos, typefaces, illustration and content. I’m not sure how, but the team managed it. 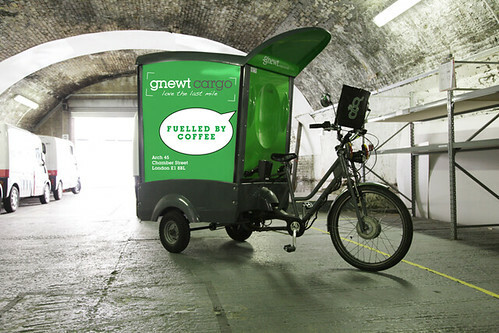 At the same time, another part of our team were busy working out how to put Gnewt’s fleet of Cargo Cycles to good use at the weekends. 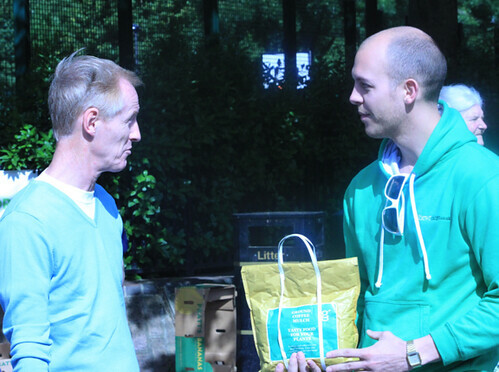 They came up with a hyper-local delivery service for existing customers’ non-urgent deliveries, a B2C service offering emission-free weekend delivery to local businesses, and a ‘coffee run’ for collecting and transporting used coffee grounds. As a pilot, grounds were collected from local cafés on the Saturday, repackaged and given away at Columbia Road flower market early on Sunday (grounds are good for mushrooms, apparently). 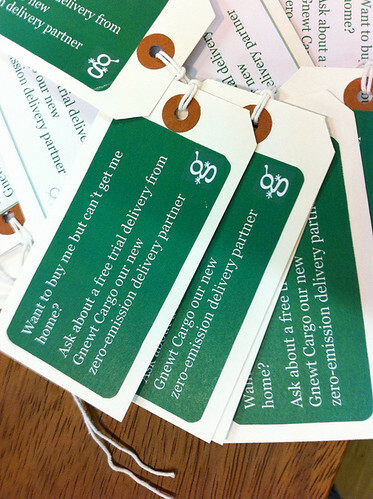 Other team members produced a poster (which could be folded into an origami truck), website labels, products, documentation and a Web-based Cargolator – a way for companies to calculate out the positive impact of switching to Gnewt by entering their mileage and number of drivers employed. At the end of Sunday, we all presented our work. The Bletchley Park team had come up with an interactive 3D map of the site, and Facebook and Twitter apps for coding and decoding messages sent using ciphers based on the Second World War Enigma machine. 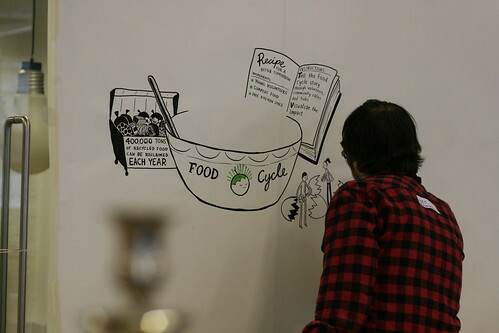 Foodcycle produced a glorious stop-motion animation, as well as taking practical steps towards better social engagement and more community building. It was an exhausting, exhilarating weekend – here’s looking forward to the next one. 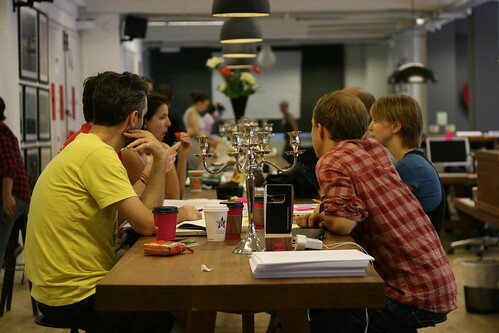 Above: Sunday morning at Good for Nothing, held at Splendid Communications office space 20-22 May 2011.